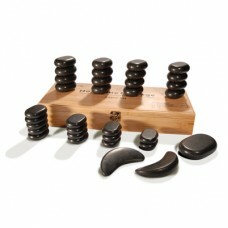 Set of basalt stones for stone therapy UMS-33TC, buy for 149 in Europe. Basalt stones are essential thing at stone therapy. However, do not think that all the rocks on sale at different sites are valuable equally. A basalt stone should be perfectly sharpened - so the body will be pleasing by the process of contact of stone with the skin. In addition, stones should be good to keep warm. After all, the heat emanating from the center of the stone will warm up the body, stimulating blood circulation and normalize blood pressure. The represented set includes stones of various sizes. The first stone is very large - it is good to stimulate a liver and a pancreas. In the packing box, you will find sixteen large flat basalt stones and fourteen medium flat basalt stones, two semicircular basalt stones complete a set. This section provides an universal set of stones for massage UMS-33TC. This set is very popular in beauty salons of Europe.